File photo of Diwali celebrations. Diwali is a Hindu celebration of spiritual light. The five-day festival, which kicks off this weekend, also recognizes Lakshmi, the Hindu goddess of wealth. Hindu believers, Indian-Americans and many others will celebrate at events throughout the Bay Area. Below is a list of local festivals and gatherings, with descriptions from event hosts. Get excited for a whole night of celebrating with a pooja, procession, performances, delicious food and dancing! Everyone is welcome, no tickets required! Fun, Food, Family & Friends thats what the Festival of Lights is all about! Live local Bollywood singers! The ceremony, known as Chopda Pujan, will take place in the evening. Hundreds of new account books – in a variety of paper and electronic forms – are sanctified through the showering of flowers petals and rice grains amid the chanting of Vedic hymns and prayers. At the BAPS Children’s Diwali Celebration, the traditional rituals are combined with insightful explanations and hands-on learning to engage a younger audience. Children participate in events ranging from games to stage shows. This event is specially designed for children to make early memories of celebrating Diwali with their families and friends. Enjoy a lavish buffet of Indian delicacies and see our Dining Hall transformed with festive lights, candles and decorations. The day following Diwali is the beginning of the Hindu New Year. The Hindu New Year is traditionally celebrated with the Annakut – literally meaning, a mountain of food. Every year a wide variety of unique thals (vegetarian delicacies) are offered in devotional gratitude for the past year and to seek blessings for the New Year ahead. The Annakut offering includes hundreds of items of food, snacks, sweets, pickles, spicy dishes, salads, fruit drinks and other items devotionally prepared by devotees. We cordially invite you for darshan of the Grand Annakut with family and friends. 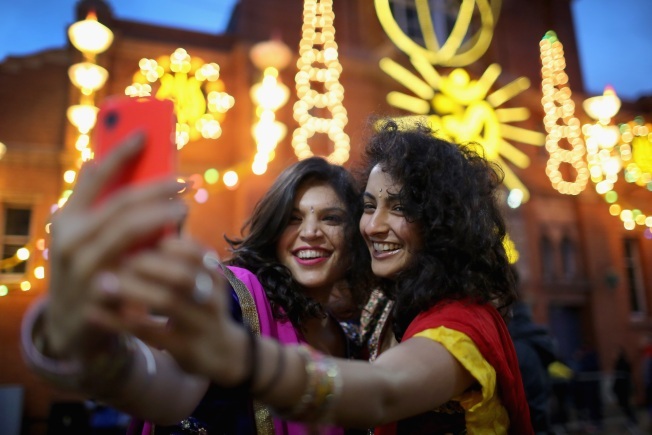 A Blend of Indian-American Festivals! Kids will participate in a rich variety of festive activities - including making diyas, lamps and rangoli art, Face Painting and Unique Harvest Activity! Children will also make meals for a local homeless shelter. Get ready for a fun-filled entertainment evening with a live band, awesome food, and much much more!